﻿National Aviation Day: Calendar, History, Tweets, Facts, Quotes & Activities. 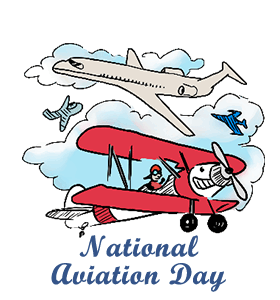 National Aviation Day commemorates the development of aviation all while seeking to promote and support the industry. In 1939, President Franklin D. Roosevelt proclaimed that National Aviation Day would be observed annually on August 19, the birthday of Orville Wright. Orville Wright, the younger of the two legendary Wright Brothers, was an American inventor and pioneer in aviation. Orville and his older brother, Wilbur, invented the world's first successful airplane in 1903. In addition to National Aviation Day, in 1959, President Eisenhower declared December 17th as the Wright Brothers' Day to commemorate the first flight of the Wright Brothers in a mechanically-propelled plane. The first controlled flight of a heavier-than-air machine occurred on December 17, 1903 at Kittyhawk, NC, USA. The flight only lasted 12 seconds and covered a distance of 120 feet. Orville and Wilbur Wright, pioneer aviators and inventors, completed 3 more successful flights on the same day. The first scheduled commercial airline flight was conducted on January 1, 1914 by Tony Jannus. The plane flew between St. Petersburg, Florida and Tampa, Florida. Over the next four months, the plane carried 1,200 passengers who had each paid a fare of $5. The Antonov An-225 Mriya is the longest and heaviest airplane ever built. The 640 ton plane was built by the Soviet Union's Antonov Design Bureau in 1988. It was used to transport the Buran space shuttle and to transfer meals to American military personnel stationed in Thumrait, Oman. Andre Borschberg holds the record for the longest non-stop solo flight in the history of aviation. Solar Impulse 2, a solar plane, flew from Nagoya, Japan on June 28, 2015, reaching Hawaii on July 3 2015, for a distance of 7,212 km and flying time of 117 hours, 52 minutes. The stars seemed near enough to touch and never before have I seen so many. - Amelia Earhart, first female aviator to fly across the Atlantic Ocean. Visit the North American Space Agency's (NASA) Visitor Centers to learn more about space aviation. Take an introductory flight lesson. Check local aviation schools in your area to find flight lessons. Visit The Smithsonian National Air and Space Museum in Washington, D.C. This museum has more than 60,000 exhibits, 1.75 million photographs and 14,000 videos about aviation and space, not to mention the world's first plane - the Wright Brother's Wright Flyer! Carey, Susan, First airline offered no frills, many thrills, Wall Street Journal, December 31, 2013, p. B4).